Jim Valentino's run on the title, from #1-27, was more than decent. 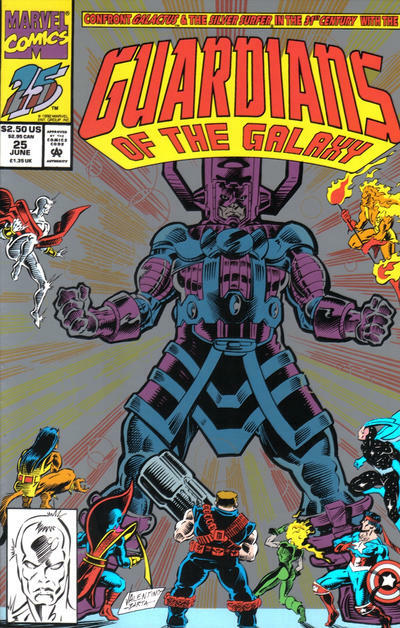 It's pretty good, actually really good when you consider the standard quality of Marvel Comics at the time. The characterization was compelling, the plotlines were — well, we'll get to those — and the art was really crisp and good to look at. 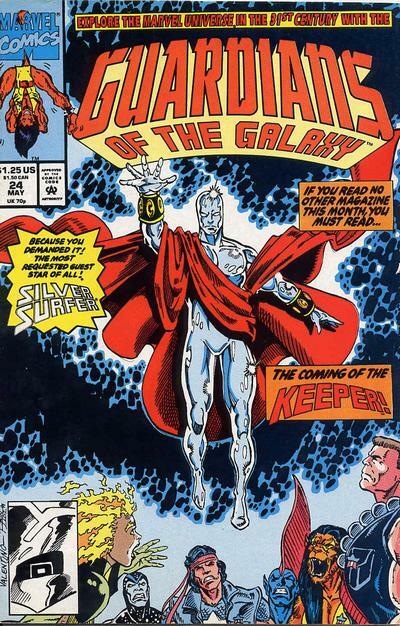 Coming from Ron Lim's art on Silver Surfer, it was a smooth transition into the second series I'd ever collect. Valentino's art was more edgy (in the literal sense, as in it had more edges), and he handled group shots well. The run after Valentino is just terrible. 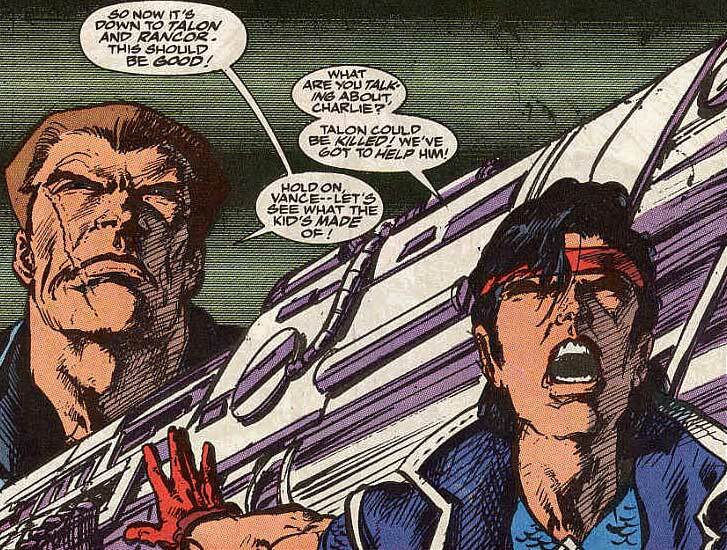 The art had stock poses, a limited number of facial expressions (often drawn on multiple characters the same way and from the same angles), and questionable anatomy. The dialogue was full of repetition (you could always count on any leader to use the word "belay," or for anyone to say "Observe how I..." when demonstrating their powers). 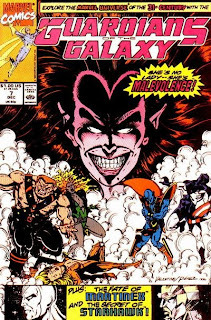 The subplots were vapid and ridiculous (my favorite is the one where Nikki, from Mercury, gets into a fight with her teammate, Charlie 27, and burns his face, leading up to Charlie's dramatic new look... where he's bald!). The final storyline revolved around Starhawk discovering that his father was Quasar, because that's ... actually, that probably explains why the book ended up being cancelled.. So given that, I've decided I'm going to limit this retrospective to Valentino's run. Because if I start talking about what came after, I'm just going to go slightly insane. Almost everything you need to know about every issue of Valentino's run, you can figure out from the covers. 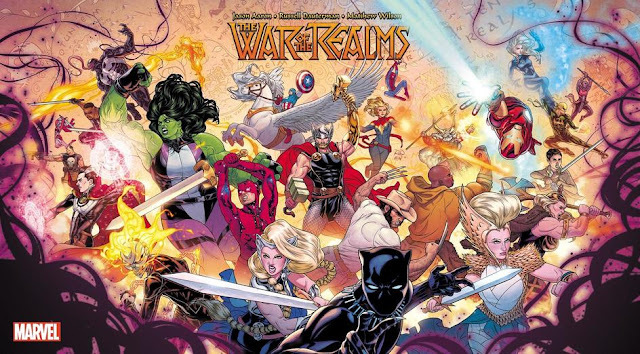 By this I mean that if you familiarize yourself with the Guardians characters (just know their names and what they look like, really) as well as with the Marvel comics of the time (this is slightly important), you can figure out the major things that happen with almost every story. 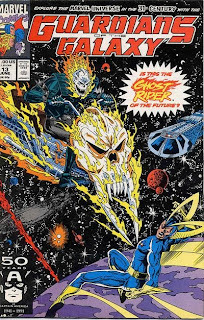 It's weird that that last bit stuck out to me, because I remember thinking that comics used to give us a hint about what's in the comics all the time, which I guess says more about today's covers more than anything else. 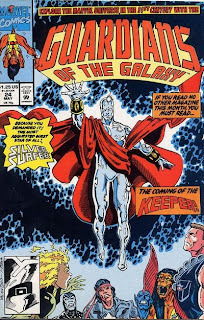 But I was thinking of the 90s Silver Surfer too, where the covers only really showed hints of what was inside but didn't really give away everything. 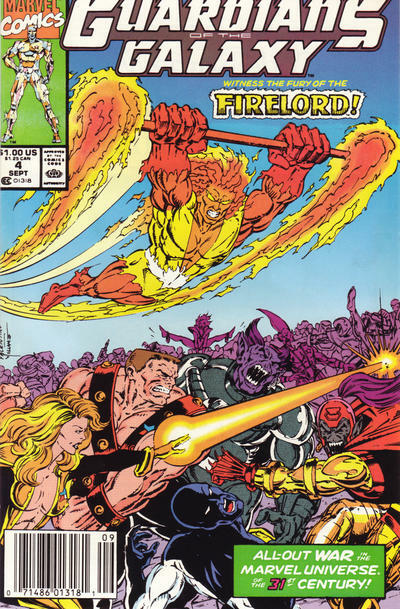 (This is partly because the Surfer series had a lot of metaphysical stories, so you could have one cover where Surfer's fighting Dr. Strange, but it's not really Dr. Strange. 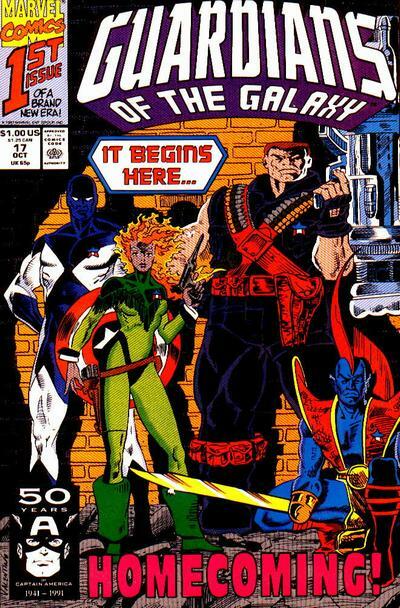 )With the 90s Guardians? You could figure out almost everything (again, if you have a decent amount of knowledge of Marvel in general). There were a few plot points — who's dating whom, being one of the big ones — that you couldn't figure out through the covers, but as far as who they fight, what it's over, and all that, the stories were that straightforward. But that doesn't mean it wasn't fun. 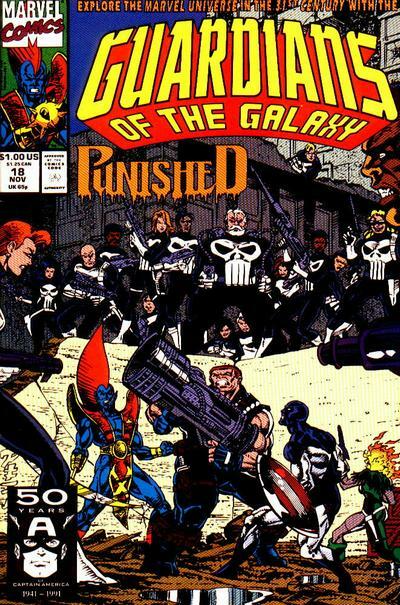 Let's look through some notable covers. 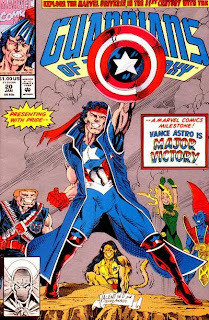 Right off the bat, the first cover introduces us to the team, in what is their most famous pose. The big dude is Charlie-27 (from Jupiter). 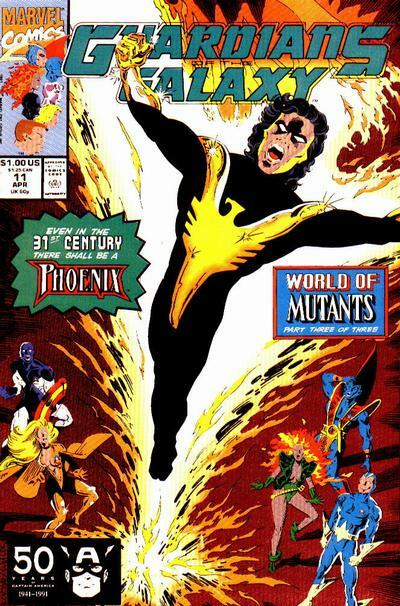 The flying dude is Starhawk from Arcturus. 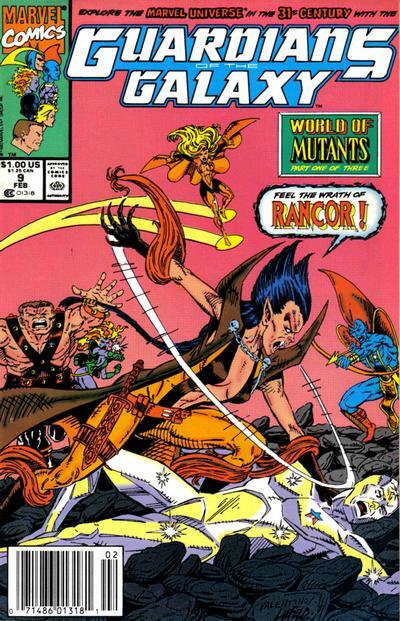 The flying lady is Aleta, Starhawk's ex-wife. The ice dude is Martinex (from Pluto). Nikki from Mercury is the firehaired girl. Yondu from Alpha Centauri is holding the bow, and that's Major Vance Astro, who is the same guy but not the same guy as the 20th century hero, Justice, of the New Warriors and Avengers, rounding out the team. All their powers are relatively straightforward looking at the cover, except for Starhawk and Aleta. 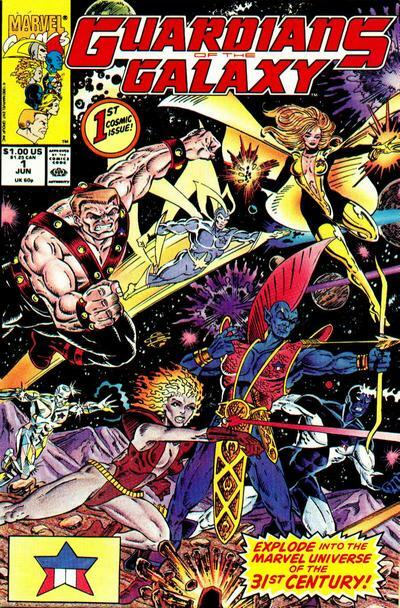 Aleta can make constructs out of light (think Green Lantern), and Starhawk shoots more energy, also out of light. Starhawk is also known as "The One Who Knows," meaning he almost always knows what's going to happen. (It's revealed later on that he lives his life over and over again, with the adult version of him eventually going back in time to relive his life from infancy onward, and that's why he knows so much.) Starhawk and Aleta, at the start of the series, also share a body, with the two of them constantly switching to each other, but that doesn't last. In the first issue, there's a conversation between Martinex and Yondu about the Guardians' background (at this point, they hadn't been in too many stories over the decades that they could recap just about everything in four pages), with Yondu noting that the Guardians, it seems, are inextricably tied to modern-day Marvel, adding that the current thing they are looking for, Captain America's shield, is tied to that era. In the second issue, modern-day Marvel is harkened once more as they meet Taserface, wearing some familiar-looking armor. 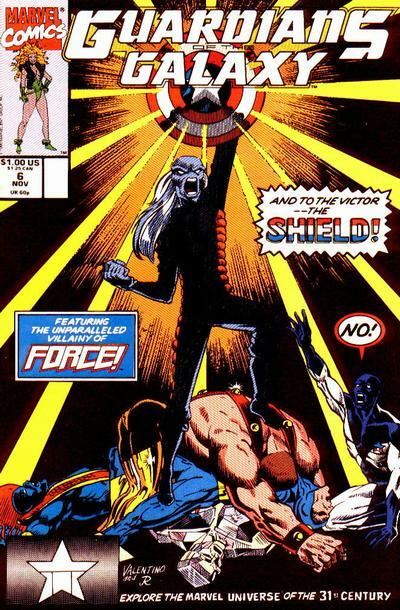 Issue #6 finally has them find the shield, up against a team known as Force (that's a great name....), and right off the bat you can tell who's eventually going to get the shield. 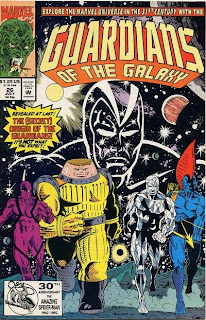 They find the shield, by the way, on a planet called Klatuu, which is controlled by the consciousness of a cybernetic mind named Mainframe, who is the modern Marvel hero known as... the Vision. This approach has two ways it could go: either it's really insular that it would have turned off casual fans who didn't know anything about the references, or it would have made casual fans more interested in those references. For me, it was definitely the latter. Valentino grounded the book in the team's characterization first, and it anchored everything. 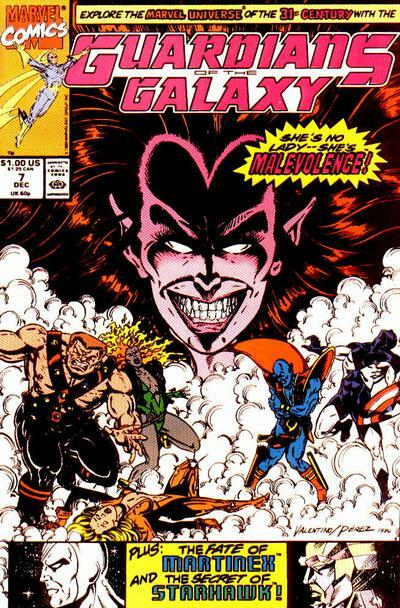 Issue #7 kicked off a long subplot featuring Malevolence, daughter of Mephisto. The storyline involved the 31st Century version of Universal Church of Truth, which Ben mentions a lot in his Guarding the Galaxy retrospective, and their new deity, the Protege, who is looking for a matriarch (a female guide to help him make decisions). The choice is between Malevolence, daughter of Mephisto, and Aleta. 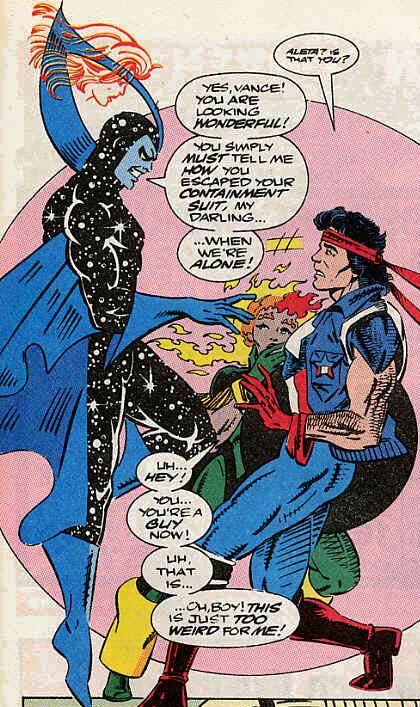 Unfortunately, Aleta gets re-absorbed by Starhawk and they both go away. Throughout the course of all that, we meet the mutants of the 31st Century, and the blurbs even use the "Mutants" logo from New Mutants back then. 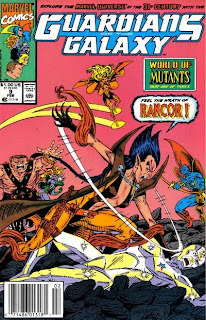 The mutants are pretty terrible people, and they're led by a lady named Rancor, descendant of... well, I'm sure I don't need to tell anyone. 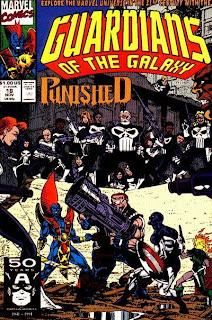 And a gang called the Punishers. 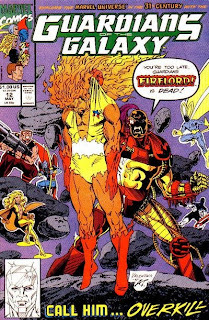 Issue #17 kicked off a whole new direction for the team by paring them down to four members and using one of the most deceiving cover tactics I've ever seen. 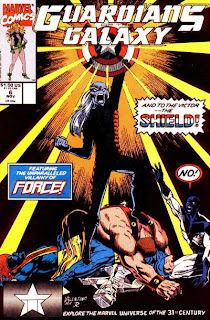 The four-members thing doesn't last long, as they quickly take on a new member named Talon, whose origins are unknown. He's got a physical fighting style and some training in the mystic arts. 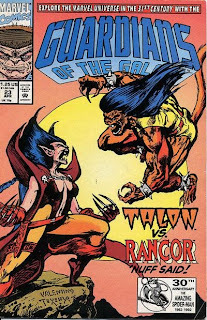 When I was a kid, I thought Talon was based on Filipinos. See, I didn't know "talon" in English meant claws, and in Tagalog it meant "jump." And Talon was always jumping. Plus, he had black hair. Long black hair. Why would I have thought otherwise? 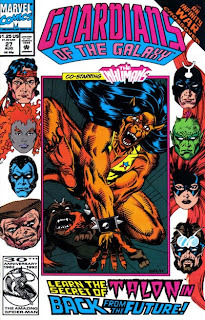 Right after his introduction, Vance gets out of his suit that's keeping his body from aging, via mystical spells and a blood transfusion from Hollywood (today's Wonder Man, Simon Williams, who spends a whole page wondering whether he should finally break a thousand-year silence with his "brother," the Vision). 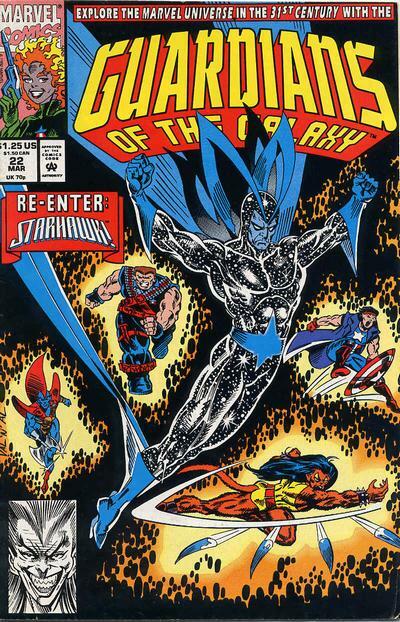 Starhawk returns, this time as "Dark Starhawk," having reabsorbed Aleta into his body. Except this time, instead of switching bodies, they just switch personalities while retaining Starhawk's body, which makes things awkward between Aleta and her would-be lover, Vance. Aleta's gestures when Aleta was in control. I love this one panel he drew. A real illusion of depth here. 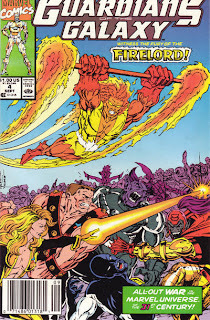 Issues #24-25 deal with the return of the Silver Surfer (known as the Keeper, the other, better protector of the universe, on account of his not being Firelord) and Galactus. GOTG had a lot of guest inkers for the covers. Also, the Jesus robe might be a little too much. 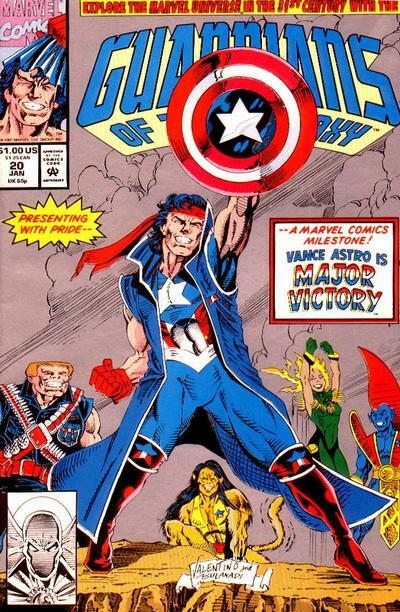 The story was pretty epic, and this was actually the first issue I bought off the shelf. I collected the back issues from there on out. 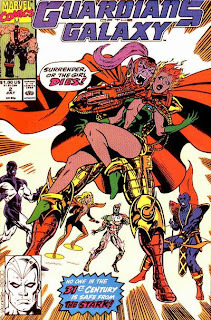 Coincidentally, this had a "death of Nova" at around the same time the main Surfer book actually killed Nova. 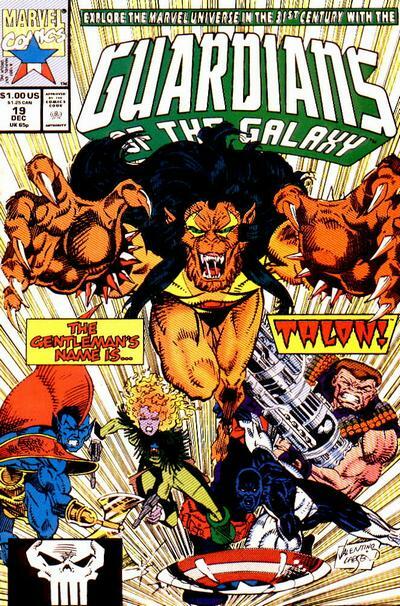 Issue #26 featured the secret of the Guardians' origin. The secret was that Starhawk clandestinely brought them together. Of course, once again, as I've said, you can figure it out from the cover. Because look at it. Finally, issue #27 had the Guardians returning to the modern era, and look, it says "Learn the secret of Talon," and it guest stars the Inhumans. So, uh, figure it out, I guess? 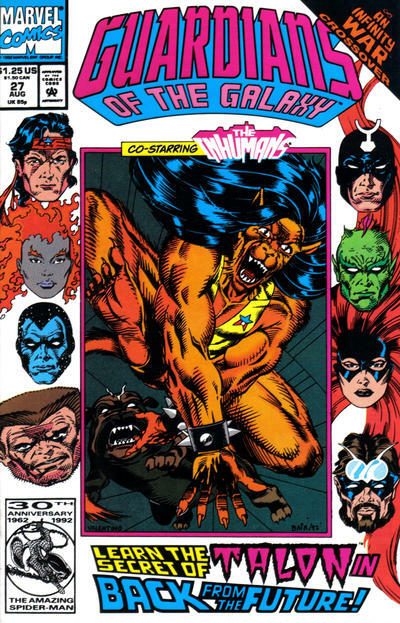 Valentino left after this issue, although the next two issues worked off of his plots, and there ended the fun ride. If you can find these issues in the back issue bins for cheap, I'd suggest buying them, especially if you were a fan of Marvel in the 1990s. The team was fun to read, the references were cool to spot, and something's got to be said for straightforward storytelling and plain fun. It's certainly a product of its time, but what a fun product of its time. Thanks for the guidelines. I've been looking for info on this series and now thanks to you, I know which run would be the safest choice.